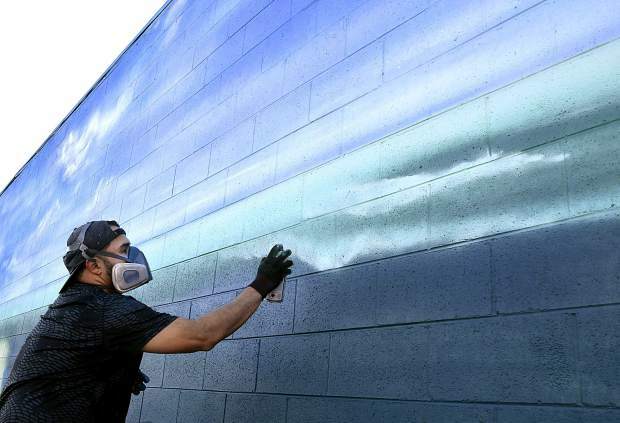 Artist Jeremy Velasquez of Rifle shapes the ocean waves, as he works on his latest mural on the east wall of Columbine Liquor at the intersection of Main Street and North Ninth Street in Silt. When finished, the mural will depict a beach scene inspired by the store owners' home state of California. Artist Jeremy Velasquez of Rifle shapes the ocean waves, as he works on his latest mural on the east wall of Columbine Liquor at the intersection of Main Street and North Ninth Street in Silt. When finished, the mural will depict a beach scene inspired by the store owners’ home state of California.